Now we REALLY know that we live in the country ... we had a VISHUS DEER visit us in our driveway! There were actually two of them, but by the time Momma grabbed her camera, the other doe had actually jumped up the bluff that you can see in the picture. We hope that they will come around to visit again, because they are so beautiful to look at! We are pretty much unpacked as much as we are going to be for now, and our new home situated as much as it is going to be. Momma and Daddy have been busy, Daddy joined the Amvets Post a couple of miles from here as a booster, and they have a favorite restaurant that they go to called the Rocky Mount Roadhouse, which isn't too far from here either. They have been meeting new people, which is a good thing for them being that they left all of their friends in St. Louis. They have taken the boat out a few times when the weather was nice, and have been spending time on the dock fishing ... Momma actually caught an 11 inch and a 12 inch crappie, she was pretty excited! We hope all of you are doing well furriends, and that you have a nice, relaxing Sunday. Pee Ess ... We read on the CB that Mr. Tigger may have been spotted ... we have been constantly purring and purraying that he will come home soon! Yikes - vishus Deer!! We're glad you're getting settled in your new home. Vishus Deer in your driveway! Run for cover! I also hope Mr. Tigger has been found. I purr every day. Hi guys!! We miss you! But we're happy to hear you are all doing well in your new home! And you get to see vishus deer now!! We get vishus deer in our yard all the time...they are scary...so be careful!!! Be careful- it's like if you give a mouse a cookie, he'll want some milk. Well, if you take fotos of Vishus Deers, they will pose for you, and want more fotos... or sumfin. Jus be carefuls. We get deer at our beach house which is in the woods. Fun to look at from the window. That vishus deer has laser beam eyes! We kind of think they are cool and not vishus at all, but then again, I'm a pretty brave kitty. If Nigel gets invited to be in a Meezer pile, rule is we all have to be invited. Mom says so. Are you prepared for an 11 kitty strong snuggle pile? I'm glad you all are settling into your new home! I was very excited when I read that Mr. Tigger might have been spotted. I hope he will be home soon! Be careful when watching the vishus deer. We glad to hear everyone is settled in. Did your mom bring home the fishies she caught for your dinner? Oh Sabrina, please be very, very careful when you are watching the vishus deer. I'm glad you're getting settled in your new house and I hope your Mom is sharing the fishies she caught. I would love to come over and run around like our butts are on fire together. That will be lots of fun! I'll telerport right over. vishus deer alert! Good thing yoo guys were inside and protected! Yikes! A vishus deer. Be very careful. We are glad you are all settling in well. We are purring that it is Mr. Tigger and he can be caught so he can return home. 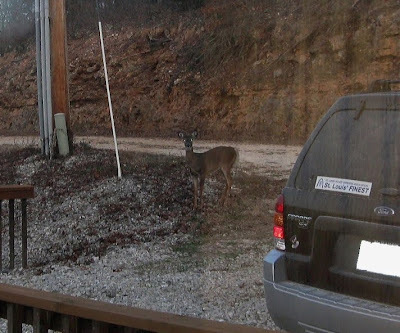 We see you are settling into the country life - vishus deer are a part of it all. We gits them here too - yeah, we live in da county as well. Did you get to help eat the fishy?